After it’s £32million redevelopment Doncaster Racecourse reopened to critical acclaim. 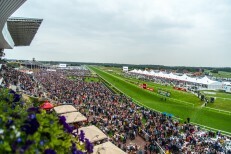 Home since 1776 to the world’s oldest Classic, The St.Leger, Doncaster is now undoubtedly one of the finest racecourses in Europe with entertainment facilities to match. Offering modern facilities steeped in racing history, Doncaster delivers first class dining against a backdrop of sporting excellence. Experience tradition, colour, excitement and a unique atmosphere together with a warm & friendly Yorkshire welcome.